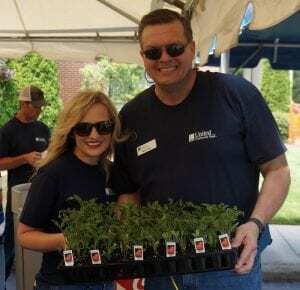 ELLIJAY, Ga. – The staff of the United Community Bank is in their parking lot today hosting their annual Customer Appreciation Day to celebrate the people who make their business. With music flooding the lot, the staff is welcoming their customers with free grilled hotdogs with all the trimmings from relish and onions to coleslaw and the usual mustard, ketchup, and mayonnaise. They are also serving Cokes and popcorn for those seeking shade under the trees. However, it’s not just food that the bank is offering today. The staff is looking to help their customers grow more than a bank account, offering tomato plants to all who attend along with seed packs for peppers and other garden vegetables. Additionally, attendees can sign up for raffle prizes to get them equipped for the gardening to come. 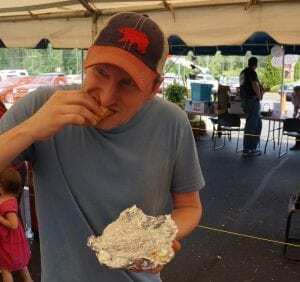 According to one staff member, Patrick McVey, the event is an annual “thank you” to their customers for the business and allows the staff to see a different perspective of the community they rely on for everything they do. Months in planning, the celebration is set to go until after 2 p.m. today though McVey said they will stay longer if they still have people. Be sure to head over to FYN’s Facebook Page to see more photos of the event. 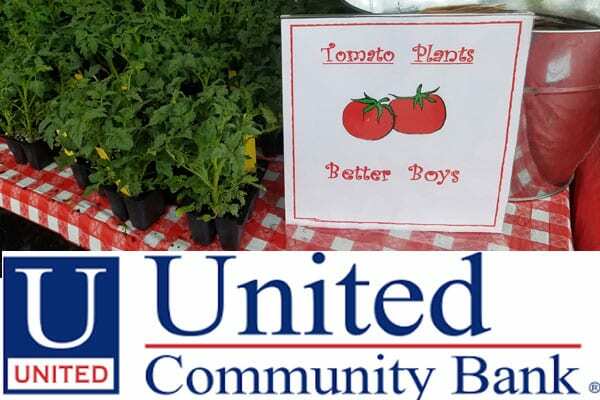 The weather was damp but the smiling faces brightened the day as the staff at United Community Bank served its customers hot dogs, cold drinks, popcorn and of course the free tomato plants. Customers could sign up for a drawing to win wonderful prizes and enjoy the picnic style meal and have a nice tomato plant to take home. United Community Bank told us why they plan this special day: In appreciation of you, our loyal customers, we host our annual Customer Appreciation Day events! From free food and treats to the iconic tomato plant giveaway, it’s just our little way of saying ‘thank you’ for allowing us to serve you! You can tell from the large attendance this event is truly enjoyed. United Community Bank employees enjoyed getting to know the customers and it was a fun way for the bank to show its appreciation! 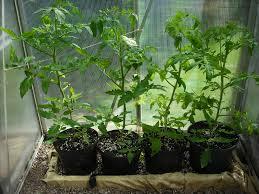 The bank gave away thousands of tomato plants today! The Gilmer County Board of Commissioners have officially approved the new changes to the County’s Land Use Ordinance. The Ordinance changes received approval on their second reading at the County’s December 8th Meeting. Having already gone through a Public Hearing and first reading in addition to several work sessions and input sessions from citizens, this comes as final approval and official adoption of the changes. To that end, the final adoption of Amendments to the Chapter titled “Farm Wineries” was also tabled until February giving the Commissioners a chance to fix the oversight through proper channels before fully adopting the new Amendments. As the whole thing ties together, the Commissioners felt they could not wait to approve the Land Use Ordinance Amendments and moved forward with them. The Farm Wineries were not the only discussion tabled as two more items received the same motion. The Awarding of the Tax Anticipation Note was pushed back as the Commissioners considered three responses. With one of the bids “not in the ballpark,” according to Chairman Charlie Paris, the Commissioners considered the lower two bids in their work session. Though it seemed they had decided on United Community Bank’s bid in the Work Session, their bid was not the lowest bid received. Park Sterling offered their bid at a lower rate as opposed to United Community Banks’ bid. The decision came at the contingency of Park Sterling’s bid. They stated their offer was “contingent upon moving accounts to their bank.” The Commissioners understanding in their work session was that the savings from the lower interest rate would have been irrelevant considering all the costs and fees of moving their accounts. Stating that the County has been drawing on their TAN later and later in the past few years, Chairman Paris stated the Board could table the discussion in order to learn more about the accounts and to find out how to handle the situation with competitive bidders now that the possibility of Accounts is being considered. As they continue researching this, the TAN is set to be reconsidered in January. As the Commissioners tabled the discussion the bids were not released, but stay with FYN as more information becomes available during this process. This item has been under consideration for quite some time as the County is continuing to search for ways to legally protect itself as well as regulate the river’s usage and deal with a piece of County owned property on Mulkey Road that is being used as an outtake for those on the river. 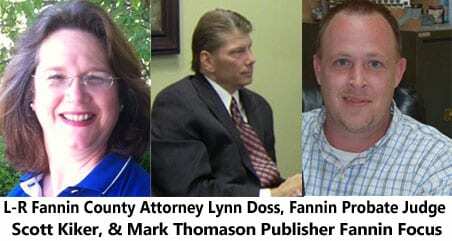 Ultimately, the Commissioners felt they had received the new documents to late to have sufficient time to look over them before advertising. 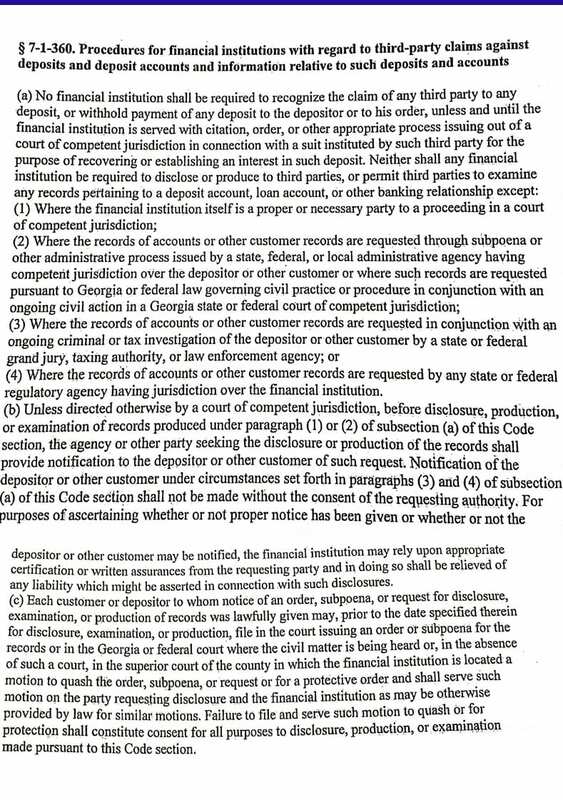 These documents have also not been released due to being under review and not approved for advertising yet. Moving through the rest of their meetings, the Commissioners have made several appointments and re-appointments to Boards and Authorities around the County. Mary Fuller-Stanley has been appointed to the Board of Public Health. Alan Davenport has been re-appointed to the Joint Development Authority as one of the County’s Representatives. He is the member whose term is ending and will continue serving uninterrupted. Lamar Walker and Paul Mooney both have terms ending on the Planning Commission. Chairman Paris indicated both are willing to continue serving and have been re-appointed to their positions. Scott Stephens has been re-appointed to his position serving on the Emergency Medical Services Council for Northwest Georgia. Stephens attended the County’s Work Session and said, though serving was far more difficult than he originally thought, he felt the County gained great benefits and information from having him on the Council and he was willing to continue his service. Pamela Rhodes has been appointed for Gilmer County to the Department of Behavioral Health and Developmental Disabilities (DBHDD) Advisory Council. One final Appointment came to move the County Clerk position out of an interim clerk and the Board of Commissioners have approved Edwina Daman to the position. However, the County will await her officially taking the position until the 19th of December. United Community Bank in Ellijay and Jasper will be hosting their Annual Customer Appreciation Day on Friday, May 6th from 10:00am – 2:00pm. Stop by and enjoy some great giveaways, delicious food and lots of family fun!